It’s been a very busy week in the fight for the 2nd Amendment here in Des Moines, as numerous pro-gun bills have passed the House and have been laid at the feet of Senate leadership. Will they take action on those bills — or maintain their blockade on the Second Amendment, as they have done with Stand-Your-Ground law and Constitutional Carry? 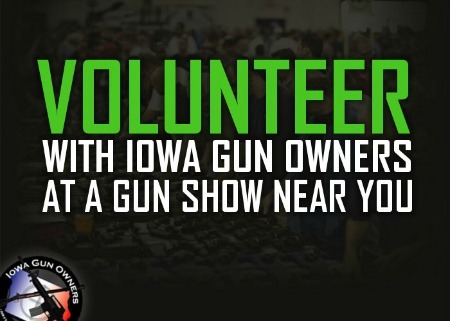 Make sure your voice is heard in this fight by getting involved in the work of Iowa Gun Owners this weekend at one of the two shows we’re coming to this weekend! In addition, take a look at this jam packed schedule of gun shows that Iowa Gun Owners will be a part of over the next couple of weeks. Again, Iowa Gun Owners will be at the gun show in Waterloo and Mason City this Friday and Saturday — come on out and join our fight to defend the Second Amendment in Iowa! P.S. Gun bills are on the move here in Des Moines — but the Senate leadership seems determined to block all legislation. Stand with us in our fight to defend the Second Amendment by getting involved in gun shows in Waterloo, and Mason City!